Twitter announced an official app for Blackberry devices .To what is considered to be a big blow for twitter app developers for Blackberry, this neat application is sure to fill the gaps. Today we are excited to announce that RIM has launched the official Twitter for BlackBerry app and can be downloaded for free at blackberry.com/twitter. This app as expected, harness the power of Blackberry devices to the maximum.The real time push of DMs and inbox integration are some examples. If you recieve an email or SMS with @username , then it will be automatically linked to this twitter app profile page. Customizable interface for changing fonts, hiding tool bars, etc. 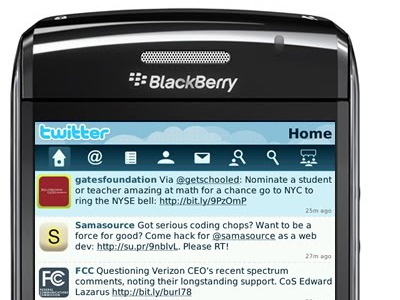 You can download this twitter app by pointing your browser to blackberry.com/twitter.